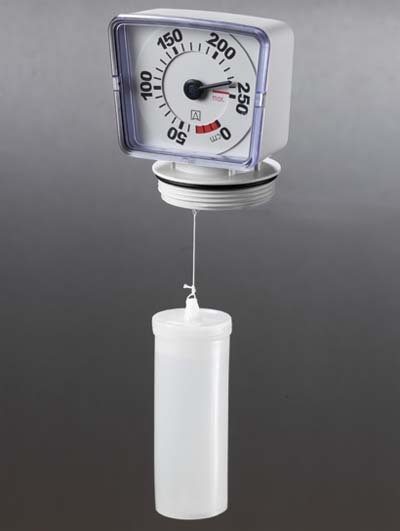 The Afriso Gauge is a universal mechanical level string gauge for measuring fluid levels in oil, DEF or water tanks. The Afriso Universal String Gauge is perfect for horizontal or vertical 275 or 330 gal. tanks. Reversible scale - 24" and 42" fluid heights (275 gal. tanks) for use with vertical or horizontal tanks. Easy to read dial face. Note: This gauge has 2" BSP threads. Although this gauge will thread into a 2" NPT opening, it should NOT be used in any tank where pressure holding capability is at all critical. Same universal, mechanical level indicator with plastic planetary gear as above, except measuring range is completely adjustable from 0 to 250 cm by reversible scale. With reversible scale 0–150 cm (approx. 59") and 0–250 cm (approx. 98") for fast adaptation to the tank height. Perfect for Water, Fuel, DEF and More!